Almost everyone that has ever interacted with Ugandan President Yoweri Museveni has called him dishonest, dubious, scheming, and, “a completely dishonorable man”. Even the man that was Museveni’s guardian as a boy, the late Boniface Byanyima, basically called him a two-faced liar. “You cannot understand Museveni at once; there is one side which he shows you, and another that he keeps to himself,” the old man remarked one time, as quoted in the Observer newspaper of 22 May 2017. These days it is Rwanda’s turn to get a taste of Museveni’s highly dubious character. Uganda’s state newspaper, The New Vision has published “a letter” from him that’s supposed to be privately addressed to President Kagame of Rwanda. Yet a communication supposed to be for the eyes of only one person somehow has appeared in a newspaper read by tens of thousands. Why? The first noticeable thing about the letter is that it is dated March 10, 2019. But it appears in The New Vision of March 19, 2019. Reliable sources have disclosed that it reached the Rwanda High Commission on Monday this week. All this indicates Museveni didn’t write the letter on that date (March 10, 2019). He only wrote it like on Monday 18, March 2019 – the very day they sent it to the Rwandan Embassy. That was after pictures leaked of the Ugandan passport he had issued to a Rwandan, Charlotte Mukankusi – a high-ranking official of the RNC, the anti-Rwanda group headed by Kayumba Nyamwasa. When pictures of the passport appeared in the media Museveni panicked and wrote the letter, backdating it to appear as if he had written it earlier. But there were more scandals the letter aimed to preempt, or to obscure before they came out. Museveni has been meeting more RNC officials, including its financial kingpin Tribert Rujugiro Ayabatwa even as he is busy denying he has anything to do with RNC. Museveni in fact is up to his neck in RNC operations in Uganda. He met Mukankusi and Eugene Gasana another RNC member, before he met Rujugiro, all in the space of just two weeks. He himself admits to having met these individuals. States are not supposed to be hosting groups subversive against legitimate governments of other states. Museveni however is caught in a situation where everyday more evidence comes to light of his active support, facilitation and aid not only of RNC, but FDLR, the offshoot group of the army that perpetrated the Genocide against the Tutsi. The way Mukankusi and Gasana were received at Entebbe when they arrived from North America is highly revealing in itself. Kampala was trying to keep the visit completely secret. Very confidential sources reveal that a vehicle received the two RNC bigwigs on the airport tarmac, and they got out of the aircraft right into the car. Ugandan intelligence agents carried their passports to handle the immigration formalities. Still, the fact of the two being in Uganda and going to meet Museveni leaked. Having then realized that the secret was out (with the appearance in the media of photos of Mukankusi’s passport) the Ugandan leader hurriedly penned his smokescreen letter. But the way he went about it is so childish it has been causing gales of laughter. That is like a five-year old saying the dog ate his homework – funny, and completely untrue. The fact Museveni has published this comically revealing letter is yet more confirmation that everything Rwanda accuses him of, as being one of the main backers of anti-Rwanda subversive forces, is true. The letter’s denials, evasions, half-truths and falsehoods all are telltale signs. Consider the fact in it Museveni has acknowledged meeting Mukankusi – and Gasana, and Rujugiro – but completely omits mention of the passport. Why not address it since it is out there – left, right and center? He avoids it because he issued the passport, simple as that. With the same childish transparency that the 75-year old Museveni goes about his affairs these days, he at the same time uses the letter to level baseless allegations. It makes one wonder, how do you meet someone “accidentally” that makes such allegations against another state, and then go ahead to publish those allegations, moreover when you are a head of state? It is completely uncouth, undiplomatic, and betrays the hostile mindset of Museveni towards Rwanda. Countries have their institutions of justice; they have their investigative mechanisms. Did Museveni bother to find out more from Rwanda about the case before publicizing such a claim from someone he had allegedly met the very first time? He did not. He merely is up to his usual dubious tricks. The fact is, the Ugandan leader only is using his so-called letter to gaslight Rwanda, even as he covers up the true subject they were discussing. They were talking about operational matters such as how, once RNC began attacking police or military installations in Rwanda, or the country’s infrastructure, he (Museveni) would then get them more support. People in Kigali have been asking: doesn’t Museveni have better use of his time than meeting three Rwandan fugitives? What would the Ugandan head of state think if the Rwandan President were to spend time meeting opponents of Museveni who label his government worse than Amin’s; or others that are ready to die fighting him? Rwanda however has played it diplomatically in face of all Museveni’s hostile acts. Kampala has been proven multiple times to be in bed with RNC, and FDLR. The illegal, and highly criminal acts of the operatives of Uganda’s Chieftaincy of Military Intelligence (CMI) and other Ugandan intelligence services against innocent Rwandan civilians have been brought to light many times. In fact in the past the Museveni regime has issued passports to FDLR bigwigs, similar to how Mukankusi got hers. The Monitor on 15 May 2006 ran a story under the headline, “Who gave Rwandan rebels Ugandan passports?” The story said one of the rebels with the passports was FDLR leader (at the time) Ignace Murwanashyaka. The New Times had been onto the story earlier – 13 April 2006 – with the following headline: “Uganda silent on Murwanashyaka illegal passport.” The paper revealed it wasn’t only Murwanashyaka mysteriously possessing a Ugandan travel document. Other FDLR rebels mentioned were Hyacinth Rafiki and Major Wallars Nsengiyumva. Kampala claimed it was investigating, but never communicated anything after. This only is an earlier example of the Museveni government’s subversive acts against Rwanda. A bit more recent was the story of the 46 recruits of RNC that were intercepted at the border of Uganda and Tanzania at Kikagati, in December 2017, en-route to RNC training camp in eastern DRC. Those young men had been recruited by CMI working hand in hand with RNC agents in Ugandan refugee camps with Banyarwanda populations. Sharp-eyed Uganda immigration officials stopped them because their Ugandan travel papers looked suspicious. Upon interrogation, members of the group confessed the papers were forgeries. CMI apparently had done a shoddy job with the forgeries. Uganda Police arrested the men and charged them with terrorism. President Museveni himself acknowledged the incident at a joint press conference with his Rwandan counterpart early last year. “When I met President Kagame in Addis he gave me some facts which I followed up,” Museveni said. “A group of Banyarwanda was being recruited through Tanzania and Burundi to go to Congo. “They said they were going for church work but when they were interrogated, it was found out the work wasn’t exactly religious,” Museveni added. He only admitted it because of the embarrassment of being caught red-handed. The UN Group of Experts Report published on 31 December last year is only the latest factual indictment of the Museveni regime for its anti-Rwanda activities. The report details Uganda as a recruitment hub for groups that have declared war on Rwanda’s legitimate government. 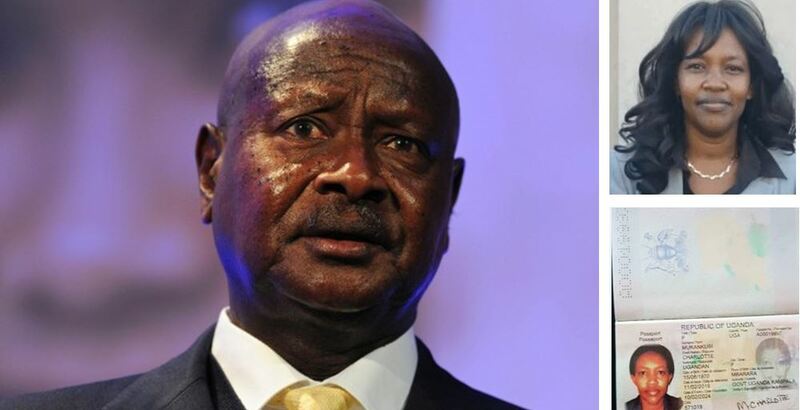 Museveni claims in his writing, “There is no question of Uganda supporting anti-Rwanda elements.” But his acts speak far louder than his words. At the conclusion of the letter, Museveni makes a claim as childish as the opening statement. “What is wrong is for Rwanda agents to try to operate behind the government of Uganda. I get a lot of stories, but I will never raise them, unless I have confirmed them,” Museveni asserts. Yet he has done the very thing he is claiming he will not do! He is leveling an allegation that even he admits he has not confirmed. That is Museveni in a nutshell.